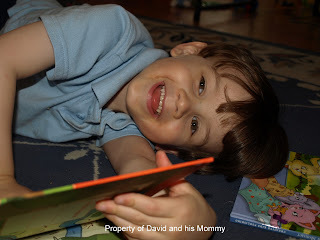 What do you say to David to elicit his thoughts? What's the book about? Tell me about the book so I can tell other people what you said? Would love to try this with my daughter (same age) and make it a feature on my blog. Oh, also, about the Wally Lamb book - it was a big disappointment, unfortunately :( My review will post the 17th, but you're not missing much! David actually read this one on his own, but I've read other books in the series with him. They are basically adventure stories set in different times and places with a great sense of humor! I basically ask him what he thought of a book and his favorite part and then I add in my thoughts as a parent. Talking/writing about books with the kiddo is a lot of fun!